Cats! Kitwits! Furry feline friends! Ahhhh, you either love them or you hate them. I personally, just love them. Call me a mad Cat Lady if you like, I don't care. I get cats, and cats get me. Hey, did you see that Superhero Cat that saved the little boy who got attacked by a dog last week? If not, you can watch it here. I rest my case. Cats rock. 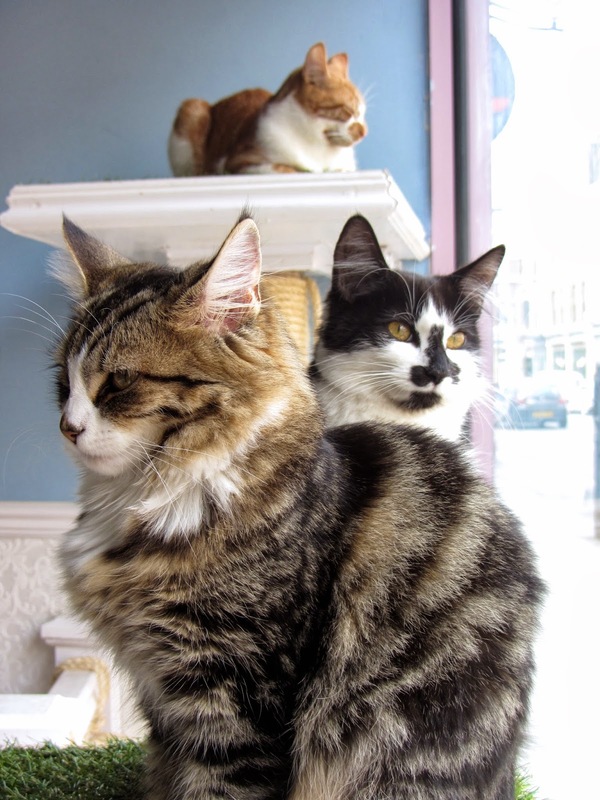 So, if you're a cat-lover and are still with me, then you may be thrilled to know that London's first cat cafe has recently opened. Yes, a cat cafe where you can literally go and hang out, drink tea, eat cake and be surrounded by lots of gorgeous, playful, cute cats. After a lot of hard work, love, labour and dedication, Lady Dinah's Cat Emporium has now opened in Shoreditch and is home to a bunch of friendly rescue cats including Wookie, Donnie, Adamska, Indiana & Mue, to name a few. There are around 15 cats currently residing at Lady Dinah's and they're the happiest, cutest bunch of kitwits you could ever hope to meet. Apart from mine, of course. Cats have the full run of the place so you just have to find a pew wherever you can - don't worry, there are plenty of sofas. 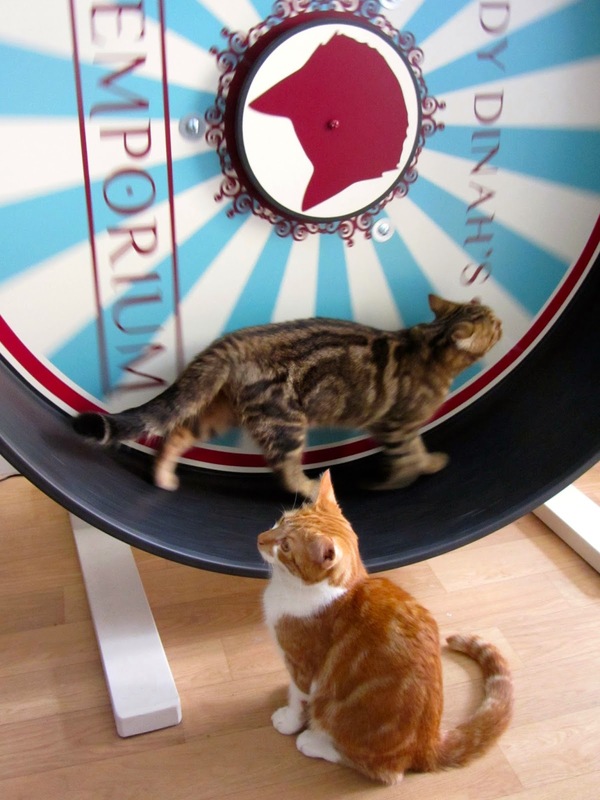 But no, you can't have a go on their giant cat wheel (Wookie is a particular expert at this - hours of fun). Whether they're hiding behind the curtains, posing on the grassy plinths in the cafe window (watch passers-by do a double take), peeking through mock picture frames in the library shelves or residing on the hessian hammock, you'll keep spotting furry paws, big eyes and little whiskers everywhere you look. It may sound like a strange or even absurd concept, but cat cafes have been around a while and are very big in Japan (quelle surprise) and are a great idea for Londoners who maybe don't have the space for a cat at home, or out of town visitors who fancy some feline company whilst reading a book and enjoying a coffee. It's a fact that cats are very relaxing, reduce-stress and are good for the soul. Er, unless you're allergic. Lady Dinah's Cat Emporium provides a safe, comfortable and harmonious habitat for these happy rescue cats where they can totally hang out, play, sleep, be themselves and probably do a lot of showing off too. The safety and well-being of the cats is a massive priority, so there are a few 'house rules' to adhere to such as let sleeping cats lie and don't pick them up - let them come to you. A box of stringy bits is provided so you can tempt them out of their hidey holes. But the main thing is to enjoy the company of cats whilst indulging in some rather delicious stuff on the menu. It's even got a live kitty-cam so you can spy on the cats from your own home. Time for a cat nap. Purrr-fect!